How many stereotypes can one company fit into a single online slot? 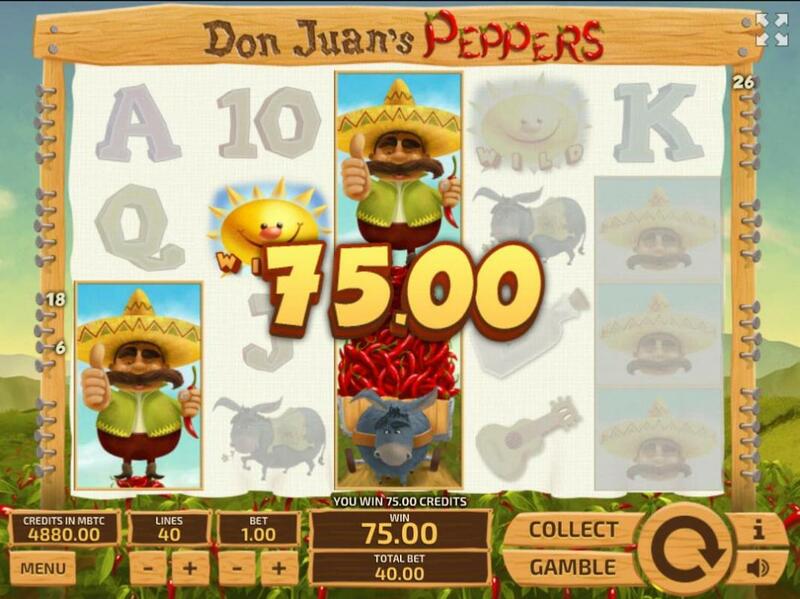 This cartoony Mexican casino game might have the answer. With his giant sombrero and massive moustache, Don Juan is a Mexican farmer. With the help of his overworked donkey, he collects fiery chillies to the lazy strums of a guitar, sipping tequila while working under the baking afternoon sun. 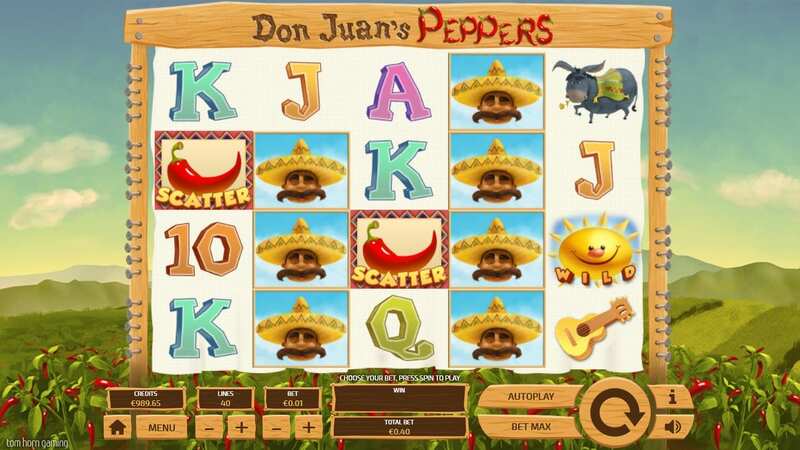 If you want a little spice in your life, wipe the sweat from your brow and spin the reels to help Don Juan get those peppers and earn yourself some cash for a hard day’s work. Play casino slots online only on Wizard Slots! Tom Horn Gaming create casino games, specialising in slots online for a number of casino operators around the world. Their expertise spans online slots for desktop, tabletop and mobile. This online slot has the usual 5 reels but unusually, it has 4 rows rather than the more standard 3. Packed with a generous 40 winning lines, total bets are fully customizable. Choose to play with any number of lines between 1 and 40; combine that with a bet ranging from 0.02 to 2.00 and you can spin with a stake of anywhere from 0.02 to a whopping 80. Check some more of the best video slot games from our guide. The design is simple but charming in its cartoonish illustrations. Chilli plants line the bottom of the screen while Don Juan can be seen farming in the distance. The music is a gentle guitar strum that kicks into that mariachi ditty the second you make a match. Disappointingly, two-thirds of the standard symbols that can appear on the Gameboard are simple letters and numbers pinched from a deck of cards. 9, 10, J, Q, K and A each have their own block colour and a 3D effect but there’s no hiding the fact that they are a missed opportunity for featuring further thematic symbols. The high-value symbols are a bottle of tequila, a guitar, Don Juan’s sleepy donkey and Don Juan himself. The Mexican farmer can appear as just his head in a single space or stacked in a lovely reel-high illustration of Don Juan standing atop a cartful of peppers being pulled by his overworked animal. A smiley, button-nosed sun is the WILD in this casino game and getting 3 to 5 of a kind reaps the highest rewards of any symbol except perhaps the SCATTER. 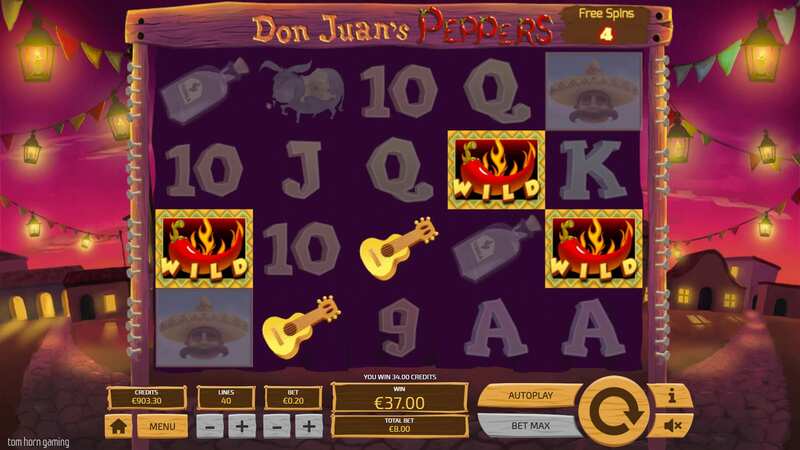 This is a chilli pepper that awards free spins according to how many land on the Gameboard – 10 for 3 SCATTERS, 15 for 4 and 25 free spins for 5 chilli SCATTERS. SCATTERS are in play during free spin rounds and have an added bonus. Landing a SCATTER during the bonus morphs it into a STICKY WILD, awarding an extra spin. Play more games on Wizard today!